Ah, the rumor is true after all. Lol. Yu Zheng confirmed Chen Xiao‘s lock down in the upcoming palace drama, Dugu Huang Hou (Empress Dugu) (独孤皇后), playing the first emperor of the Sui Dynasty – Emperor Wen of Sui, who’s famous for having the fewest concubines due to his love and respect for his one Empress, Empress Dugu. They met young and he promised that she would be the only woman to carry his children. I can see Chen Xiao in this role. Yep. If you doubt his ability to show he would only love one woman, watch Female Prime Minister…. oh my heart! Maybe I need a rewatch! Chen Qiao En was confirmed in last December with rumor of Chen Xiao as her hubby. They were in The Swordsman together. heheh. Trolling them with this photo! Filming will begin in 2 weeks! 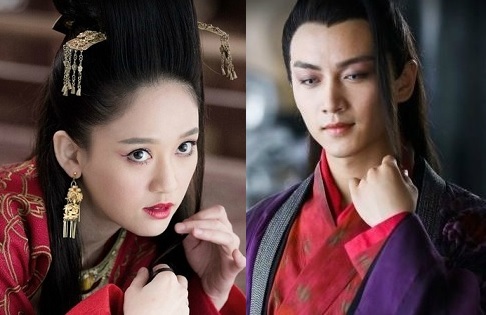 This entry was posted in Entertainment News and tagged Cdrama, Chen Xiao, Joe Chen Qiao En, Queen Dugu (独孤皇后) by Kappy. Bookmark the permalink. Their last historical collab few years ago (and a Yumama production) gave me the shudders. Though they were not a couple there, and Chen Xiao is not Xiang Yu. Not sure if it was the horrid costumes in that drama, but Chen Qian En looks incredibly out of place in historicals – she simply doesn’t have that look to her/too moden looking. Isn’t there another Dugu drama coming out or in production? With the Dong Fang Yuqing from Journey of Flower as the Emperor. Tbh I was never fond of CQE in historical dramas as well, because I feel she looks out of place too. Hopefully this will be good. I am very interested in this so lets hope it lives up to the hype. I think i like this couple more, since they match more age wise and look wise. Hu bing qing is a little too young for andy. Loooove Joe Chen. Also a big fan of Chen Xiao. Yumama aside (why would CQE even collaborate with this guy? ), I think this is a great pairing. Isn’t he a bit too young to play Emperor Wen (who was like 40 when he became emperor) though?